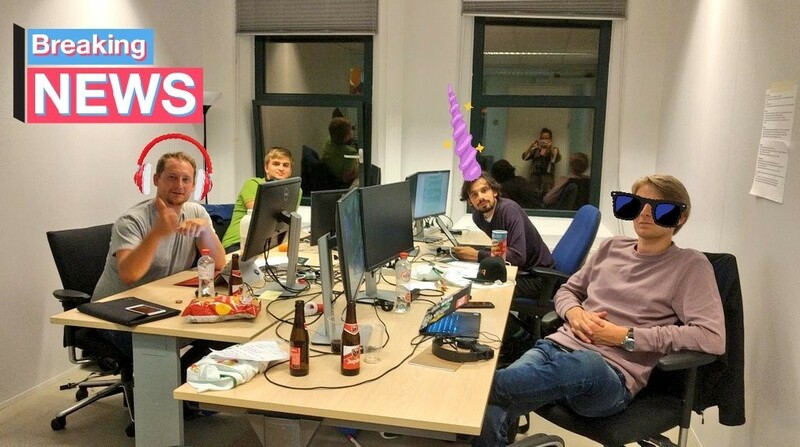 bunq Hackathon - Team overview! Below you find a full overview of all teams (in alphabetical order). If you have any comments or additions to the list below, let us know through bunq.com">bunqhackathon@bunq.com. Description: A Patreon alternative where YOU control the money. Description: Appronto created a better payment experience with zero click iDEAL payments. Payments via iDeal can be done automatically if the amount is below your personal limit. We believe that with this revolutionary zero-click experience every bunqer will save time they can spend on doing what they love instead. Description: bunqLoot is the automated finance solution for all your loyalty programs. Whenever you pay with your bunq card, you will receive the discount of any of your loyalty cards right away. Description: bunqpoly is a multiplayer bord game, which is based on Monopoly. When creating a game, the user defines the joining cost of the game. The winner will receive all joining fees! Description: Don't run, but confront your spending habits head-on by knowing where, when and how much you spend. bunqMaps is an interactive solution for people who want to tackle their spending habits. Description: bunq SmartSelect activates when you make an NFC payment by phone and suggests from which account you want to make the payment. Description: Doekoe is a smart financial coach that enables everybody to handle their finances in a smart way. It analyzes your spending behaviour and suggests a plan to gain control over your financial balance. It suggests smart actions to help you spend and save according to your income. Because everyone deserves more. Description: An app that allows you to set expense goals, for instance: I don’t want to spend more than €20,- at the McDonald’s this month. After you’ve set the goal we will monitor your debit card payments. If you exceed the limit set on the goal we will donate a set amount (percentage or fixed amount) of money to a random charity from a list that you created. You can choose freely from the 160+ charities we included in the app. Using our app you’ll manage your bad habits while doing good for the world. Description: Double Driver, the only bunq chatbot you need. Description: FWDpay allows people to send mandates to the people who help them in any kind of way. From elderly that are in need of medicine to getting groceries for your neighbor in a wheelchair. It’s all possible with FWDpay. Description: Makes it possible for users to easily implement complex if this then that flows regarding their money. Using the bunq API they created webhooks which they plugged into Zapier. This makes it possible to automatically pay your invoices, but also to automate creating and sending invoices! Description: A platform on which you can add chores you rather not do yourself. Add (or find) a quest for a little bit of money. When the quest is fulfilled, the person get’s paid right away! Description: LockMeUp allows you to put a lock on your savings accounts. Choose your own unlock date and the money is safely kept from your crazy spending behaviors. Description: Set your own saving goals with punq and decide how you want to safe! Description: Receiptr created an app that let's you collect your receipts digitally by using a wireless connection between the app and a cash register. No more paper needed! Description: A compleet B2B solution for those who want to save forests. Businesses can create their own campaign such as buy 5 coffee and get 1 for free. No more need for stamp cards, ever! Description: bunq buddy is a budgeting app for the financially impaired. It helps the clients of financial help institutions to get them out their financial problems. Description: A GUI with the power to put the amazing possibilities of the bunq API into the hands of the everyday user. Fully built with expansions in mind. Pimvdnoll I want diz now! Pimvdnoll looks pretty awesome Pim! Job well done! Big High Five 🙌 on that. For IRL Quest the bunq.me link is wrong. It should be /epicivo/0.01. Did we go from a week as a timeframe for the second prize to almost a month? Following the excitement of the Hackathon, we decided that extending the voting time allows us to better highlight all of our amazing teams! So make sure to cast your vote for your favorite idea by the first of October 💪. Good catch on the date change and we appreciate you following up 👍. 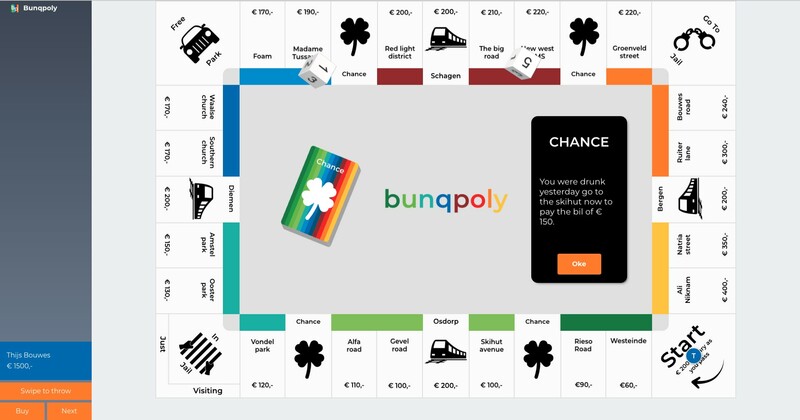 Bunqpoly is a multiplayer bord game, which is based on Monopoly. When creating a game, the user defines the joining cost of the game. In this example five users * 5 euro = 25euro. The app uses, Bunq Requests for automating the payment requests. We also use the Notification filters, to automate the processing of the pending payments. When a change is made in the lobby, the data will be transferred to the client (web sockets / pusher). I see some pretty amazing stuff here. Just want to complement you all. It is truly exceptional what you guys (and girls?) accomplished is just 24 hours. And of course also want to compliment bunq for making this contest possible. So, hopefully this inspire more bunqrs to start building together the next level of banking! bunq, banking that sets you free. Very cool, compliments to all teams! Inspires me to finish my project.